February 6, 2014 | David S. Maldow, Esq. It appears that Vidyo, previously derided by competitors as the industry's "interop problem child" has flipped the script on us, and is now proclaiming themselves the new leaders in videoconferencing interoperability. While the other players in the industry will hotly contest this (no angry emails please), when you are Google's choice for interop, you must be doing something right. We talked with Vidyo Evangalist, Marty Hollandar, about the new VidyoH2O interop service for Google Hangouts, as well as Vidyo's continued leadership in the development of today's (and tomorrow's) SVC enabled video protocol standards. Please read through for the rest of the story, and for more background on Vidyo, please read the free TPO News White Paper, "Visual Collaboration For Small to Medium Enterprise." (Note: This YouTube video is not directly related to today's announcement, but gives a nice overview of Vidyo). H2O stands for "Hangout to Other". Sounds simple enough, but there is a bit more to this service than meets the eye. In technical terms, it allows for connections between Google Hangouts and standard meeting room VC systems, as well as PBX phone systems. 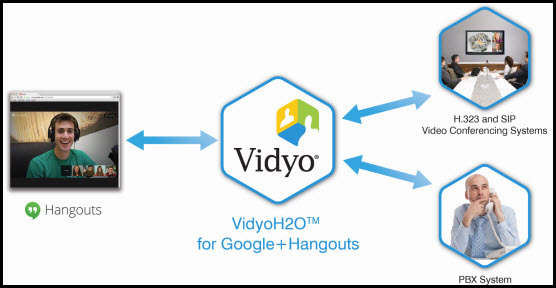 Google is opening the gates to their Hangouts, using Vidyo's service as the key. Looking at the slightly bigger picture, this means that Google Hangouts just knocked out one of my personal reasons for dismissing it as a viable business tool. At the very least, this development boosts it up from a consumer-only product to a consumer-plus product. A little background on Google Hangouts might help to explain the significance of this announcment. Hangouts are the shining stars of the Google+ platform, Google's answer to Facebook (G+ still isn't really "happening" but Google is determined and is still pushing it). Despite the struggles of the Google+ platform overall, the Hangouts themselves have been a massive hit. It's free mulitpoint video, with quality that is above par for commercial solutions. And, as typical with Google solutions, it is open to third party apps, which means developers have created countless "add ons" for Google Hangouts. Some of them are no more than games or toys, but some are true business productivity applications. The end result is that you can do a lot of cool and fun things on Google Hangouts that can't be done with typical VC solutions. The one thing you couldn't do was integrate it with your existing videoconferencing deployment, until now. As with any other technology, the choice between a pure business solution (such as Vidyo's own offering) and a consumer-plus solution is dependant on your environment and needs. There is no right solution for everyone (yet). But Google Hangouts are now an option for a much larger number of businesses. Many companies have existing videoconferencing systems in place. You can't expect these companies to sign up for any video service that will not connect to these systems. It's a non-starter. Even a free service like Google Hangouts has little chance of adoption without addressing these systems, which is exactly what VidyoH2O has done. To look at the even bigger picture, this is a direct challenge to Microsoft in the big UC wars. Some of my IT decision maker contacts at large enterprises are telling me that they currently facing this Microsoft v Google choice. There is no clear winner, they both have strengths and weaknesses, but they are both clearly going for the same thing, to own the enterprise. Microsoft pulled everything into Office 365 and Google is pulling everything into Google+. Last year I could say I had choice between Outlook or Gmail, and I had a choice of Gchat or Lync, and a choice between Gdocs and Word, etc. Today they are really forcing us to choose if our business is a complete Microsoft or Google setup. My team is still using both (and everything else, it is our job to play with this stuff), but at some point one will have to become our primary tool. VidyoH2O doesn't, by any means, end this big UC war. If anything this may heat it up even more. As far as the details of the service itself go, it is pretty straightfoward. VidyoH2O will use the "port based" pricing model used by similar, enterprise facing, VC services. In layman's terms, it is somewhat like shared licenses. If you have 10 meeting rooms, but only have 2 in use at any time, you only need two subscriptions which can float among your 10 rooms. As long as you have an available license, any of your room systems can use it to connect Google Hangouts. While these connections are the focus of this announcement, the real story is that the companies will be free to adopt Google and use its service throughout their environment. The VidyoH2O announcement is part of a larger Vidyo and Google story. These organizations have been partnering since 2008, and the main result of that partnership (Hangouts) has been a massive global success. I believe that I caught Marty referring to VidyoH2O as "the first" actual product to come out of this partnership, but any questions about future products got me nothing but smiles and winks. While consumers are primarily product focused, geeks like me are fascinated by the protocol development taking place behind the scenes, so let's take a quick look. For a little background, please check out this article I wrote last August on Vidyo / Google's work together on scalable WebRTC. To vastly oversimplify, back in the day Vidyo changed the game by adding "SVC" to the H.264 video standard. Now they are working with Google to add SVC to V8 / V9, the competing standard, and the one used by Google Hangouts. The world is watching as the protocol gods work their magic to develop the new V9 standard from V8, and Vidyo is actively involved in the development, as they are the experts in the room when it comes to incorporating SVC technology. With all this talk about VP9, I must mention the competing standard, HEVC (aka H.265), the successor to H.264. The videoconferencing industry is currently experiencing something similar to the old VHS v Betamax war. There are two viable standards, and extremely heated arguments about which one is the future. Perhaps both will survive, or perhaps one will become the new Betamax. The good news for Vidyo is that they are deeply involved with the development of both standards, taking a leadership role in the SVC extensions in particular, their bread and butter. In fact, they have already made 58 contributions toward HEVC and its SVC extension. So Vidyo has two horses in the big protocol race. It's nice to have two horses in the race, but it's even nicer when they are the only two horses in the race. The future of videoconferencing is always a bit murky. But one thing we can see clearly is that SVC will be a big part of it, and Vidyo is still the undisputed leader in SVC technology. It is also pretty clear that Google sees the value of videoconferencing and wants in on the game in a big way. 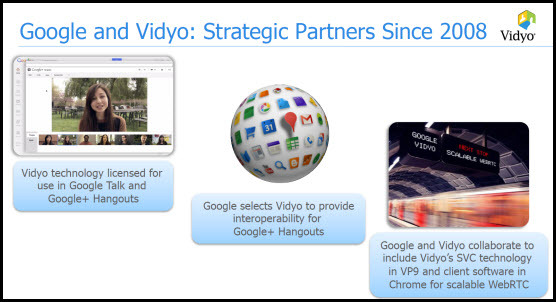 As Google's "go-to partner" for VC technology, Vidyo is sitting in the catbird seat. It appears that Vidyo, previously derided by competitors as the industry's \"interop problem child\" has flipped the script on us, and is now proclaiming themselves the new leaders in videoconferencing interoperability. While the other players in the industry will hotly contest this (no angry emails please), when you are Google's choice for interop, you must be doing something right. We talked with Vidyo Evangalist, Marty Hollandar, about the new VidyoH2O interop service for Google Hangouts, as well as Vidyo's continued leadership in the development of today's (and tomorrow's) SVC enabled video protocol standards. Please read through for the rest of the story, and for more background on Vidyo, please read the free TPO News White Paper, \"Visual Collaboration For Small to Medium Enterprise.\"
\n \n (Note: This YouTube video is not directly related to today's announcement, but gives a nice overview of Vidyo). H2O stands for \"Hangout to Other\". Sounds simple enough, but there is a bit more to this service than meets the eye. In technical terms, it allows for connections between Google Hangouts and standard meeting room VC systems, as well as PBX phone systems. Google is opening the gates to their Hangouts, using Vidyo's service as the key. Looking at the slightly bigger picture, this means that Google Hangouts just knocked out one of my personal reasons for dismissing it as a viable business tool. At the very least, this development boosts it up from a consumer-only product to a consumer-plus product. A little background on Google Hangouts might help to explain the significance of this announcment. Hangouts are the shining stars of the Google+ platform, Google's answer to Facebook (G+ still isn't really \"happening\" but Google is determined and is still pushing it). Despite the struggles of the Google+ platform overall, the Hangouts themselves have been a massive hit. It's free mulitpoint video, with quality that is above par for commercial solutions. And, as typical with Google solutions, it is open to third party apps, which means developers have created countless \"add ons\" for Google Hangouts. Some of them are no more than games or toys, but some are true business productivity applications. The end result is that you can do a lot of cool and fun things on Google Hangouts that can't be done with typical VC solutions. The one thing you couldn't do was integrate it with your existing videoconferencing deployment, until now. As far as the details of the service itself go, it is pretty straightfoward. VidyoH2O will use the \"port based\" pricing model used by similar, enterprise facing, VC services. In layman's terms, it is somewhat like shared licenses. If you have 10 meeting rooms, but only have 2 in use at any time, you only need two subscriptions which can float among your 10 rooms. As long as you have an available license, any of your room systems can use it to connect Google Hangouts. While these connections are the focus of this announcement, the real story is that the companies will be free to adopt Google and use its service throughout their environment. The VidyoH2O announcement is part of a larger Vidyo and Google story. These organizations have been partnering since 2008, and the main result of that partnership (Hangouts) has been a massive global success. I believe that I caught Marty referring to VidyoH2O as \"the first\" actual product to come out of this partnership, but any questions about future products got me nothing but smiles and winks. While consumers are primarily product focused, geeks like me are fascinated by the protocol development taking place behind the scenes, so let's take a quick look. For a little background, please check out this article I wrote last August on Vidyo / Google's work together on scalable WebRTC. To vastly oversimplify, back in the day Vidyo changed the game by adding \"SVC\" to the H.264 video standard. Now they are working with Google to add SVC to V8 / V9, the competing standard, and the one used by Google Hangouts. The world is watching as the protocol gods work their magic to develop the new V9 standard from V8, and Vidyo is actively involved in the development, as they are the experts in the room when it comes to incorporating SVC technology. The future of videoconferencing is always a bit murky. But one thing we can see clearly is that SVC will be a big part of it, and Vidyo is still the undisputed leader in SVC technology. It is also pretty clear that Google sees the value of videoconferencing and wants in on the game in a big way. As Google's \"go-to partner\" for VC technology, Vidyo is sitting in the catbird seat.